First, only The Shadow knows that beautiful aromatic golden roses mask "The Scent of Death." 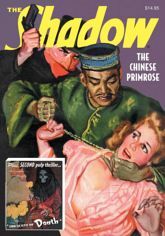 Then, the Knight of Darkness confronts an Asian princess and a murderous pirate in San Francisco's Chinatown when "The Chinese Primrose" leads to the bizarre disappearance of a priceless necklace from the Manchu Dynasty! Finally, Carrie Cashin investigates "The Hollywood Mystery" in her first illustrated adventure from SHADOW COMICS #1. This classic pulp collection features the original color pulp covers by Graves Gladney, interior illustrations by Earl Mayan, and historical commentary by Will Murray.